Châteauneuf-du-Pape is located nine miles North of Avignon in the Southern Rhone Valley of France. The Rhone River and Mount Ventoux, which is famed for being one of the most difficult sections of the Tour de France, border the region. Châteauneuf-du-Pape’s climate is ideal for grape-growing with hot, dry summers and cool, wet winters. Most of the rain occurs in winter or spring, and there is abundant sunshine during the growing season. The area is also greatly impacted by an intense wind called the Mistral, which originates in the cold air masses of the Atlantic Ocean and the North Sea. The wind, which can blow at speeds of more than 60 miles per hour, is funneled through the Rhone Valley towards the warm Mediterranean Sea. It clears the clouds and chases away the humidity, which helps to prevent rot, decreases disease pressure on the vine, and allows for organic and biodynamic farming. However, the strong wind can also rip off the leaves and grapes and destroy a crop. 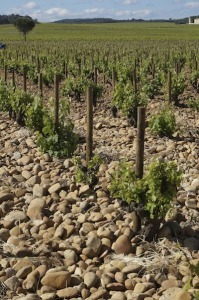 The soil in Châteauneuf-du-Pape is covered with galets, round rocks that were rolled and smoothed by the Rhone River. These aren’t pebbles, though – some are as large as footballs. The stones radiate heat from the sun aiding in the ripening of the grapes creating powerful, age-worthy wines. Red wines represent 93% of the region’s production, with the balance being white wine. There are 13 grape varieties permitted in red Châteauneuf-du-Pape. Grenache makes up two-thirds, and sometimes more, of most reds. Syrah, Mourvedre, and Cinsault are also commonly added to the mix. The white Châteauneuf-du-Pape is made from a blend of Clairette, Roussanne, Grenache Blanc, and several other white grape varieties. Châteauneuf-du-Pape is an aged wine that pairs well with a variety of foods. The red wines of Châteauneuf-du-Pape are quite complex and diverse, but you can often find both black and red cherry fruit, strawberry, earth, black pepper, spices and garrigue — the local scrub brush made up of herbs, such as lavender, rosemary and thyme. 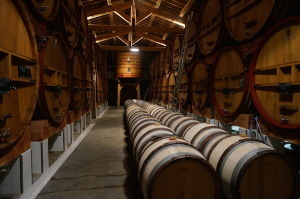 “Its wide array of aromas and flavors are reminiscent of a Provençal marketplace while its texture—rich and round, sumptuous and opulent—is virtually unmatched by most of the wines of the world,” according to Robert Parker, one of the leading wine critics in the United States. 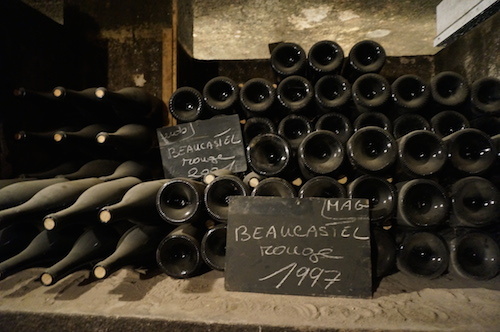 For more insights on Châteauneuf-du-Pape wines — and other wines from around the world — Double Decanted offers a collection of bottles at a variety of price points. Let us help you find the perfect bottle – or bottles – for any occasion! To set up an appointment, please email Kelly@doubledecanted.com.